I have always been an artist, beginning in grade school, making tiny cardboard houses with tiny cardboard furniture for my tiny plastic animals to live and play; sculpting ceramic animals out of clay, drawing animals, painting wall mural animal scenes in the school hallway… notice a theme? Animals! The watercolor paintings I create today are about animals; my love, respect, and unending interest in animals of all kinds is the motivation behind my artwork. Without the animal as the center, there is no story for me to tell, no picture that I feel compelled to paint. These paintings are my heart… in color, on paper, to share. I grew up in Ann Arbor, Michigan. After college I moved to Northern Michigan and spent the next 20 or so years as a career artist, painting, doing art fairs/shows, owning an art gallery (Arktos in Petoskey) and mothering two daughters (Scarlett, now 17, and Isabel 11) in the company of a variety of dogs, of course. These days, I live in Grosse Pointe, Michigan. 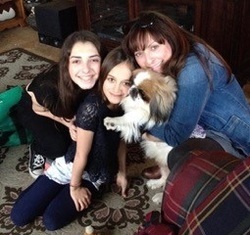 With my daughters, and 3 dogs: a French Bulldog named Veronika, a Cavalier King Charles Spaniel named Jackson, and Hachi, a Japanese Chin. Still painting and creating… I am forever an artist. However, I’m also a new attorney. In Spring 2015, after working in a small law firm for a year, I began a solo family law practice.